Dale and Lisa had their very punny concept printed up at a T-shirt shop. Then there is my sentimental favorite. 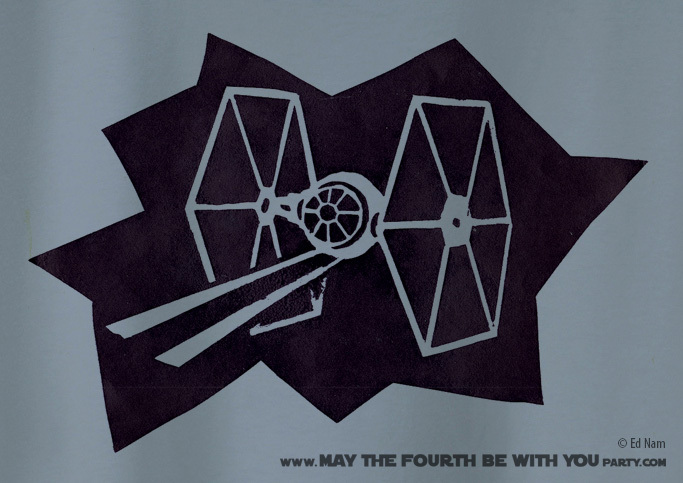 When my hubby was 12 years old (right at the height of the Star Wars craze) he cut this silkscreen design and printed T-shirts for himself and his friends. Unfortunately, he doesn’t have any shirts left, but he still has a test print on paper. I’m planning on making a reprint, and I down the line will post a how-to, in the meantime here is a picture of the print. As a Star Wars fan, love your blog! So many interesting ideas, costumes, etc. 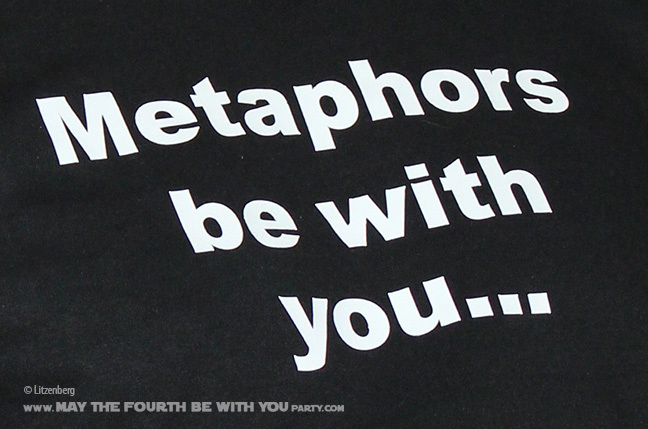 The force is obviously stron with you! Thank you for your kind words! We are having a lot of fun with it! As we “speak” we are working hard on the food and decorations for this year’s party! So be sure to check back throughout the year, we will have LOTS of new things to post. 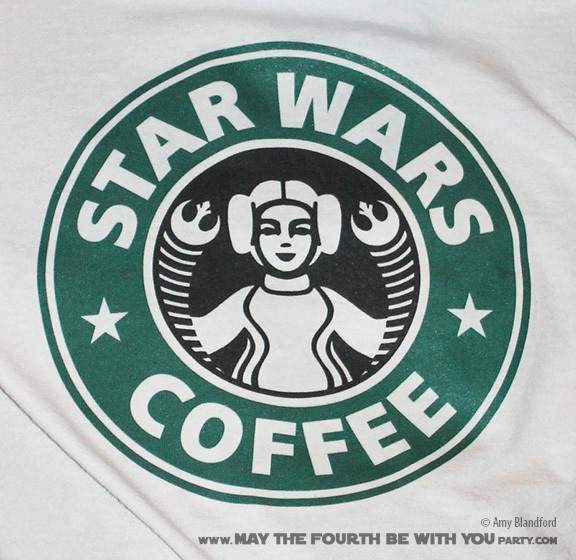 I would LOVE to get the Princess Leia Star Wars Coffee shirt. I tried messaging Amy Blandford but didn’t get through. Any suggestions of how I might be able to get this would be super awesome!!! 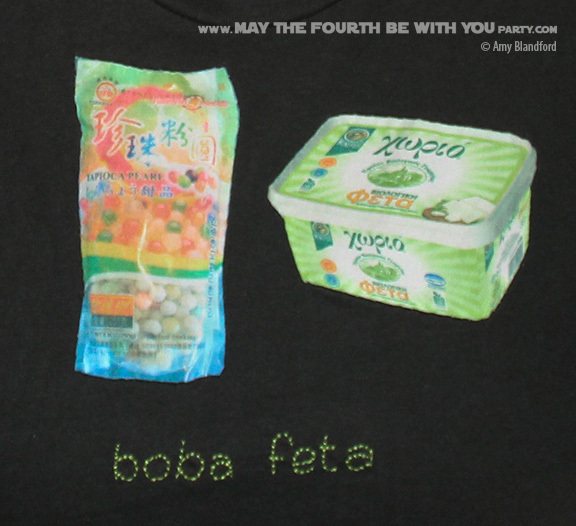 I am thrilled that you like the Princess Leia Coffee shirt, it is one of my favorites too. I contacted Amy, and am so sorry to tell you, she can’t the files for the shirt 😦 (She was looking, that’s why it took so long so get back to you, sorry!) welovefine.com is my favorite place to go for Star Wars shirts, but I know those are not the shirts you are looking for.